Download "MASTER OF SCIENCE IN NURSING"
1 300 MASTER OF SCIENCE IN NURSING Clarke University offers a Master of Science in Nursing degree in Nurse Educator and Family Nurse Practitioner programs, a post-master s certificate program and a master s completion option for certified advanced nurse practitioners. Master of Science in Nursing Family Nurse Practitioner Program Outcomes Clarke University envisions graduates of its MSN-FNP program to be persons who will: Synthesize concepts and theories from nursing and related disciplines to form the basis for developing and integrating new approaches to nursing practice for the whole/healthy human being. Analyze social-cultural, spiritual, ethical, economic and political issues that influence and lead to the highest level of nursing practice. Utilize the process of scientific inquiry to validate and refine knowledge relevant to nursing. Demonstrate leadership and effective management strategies for advanced practice, including proficiency in the use of information systems/technology resources to support practice and ensure continuity of patient care. Design and implement advocacy strategies that address health care policies and issues of social justice and equity in healthcare. Demonstrate the ability to effectively communicate and engage in collaborative intra- and inter-disciplinary relationships in the conduct of advanced practice. Demonstrate effective direct patient care, clinical prevention and population health care within the context of socio-economic policies, appropriate scientific data, and the exigencies of the individual patient. Demonstrate expertise in a defined area of advanced practice and develop and articulate a vision for nursing practice in a selected organization. Students complete the 45 credit hour Master s program in two years of FT study. 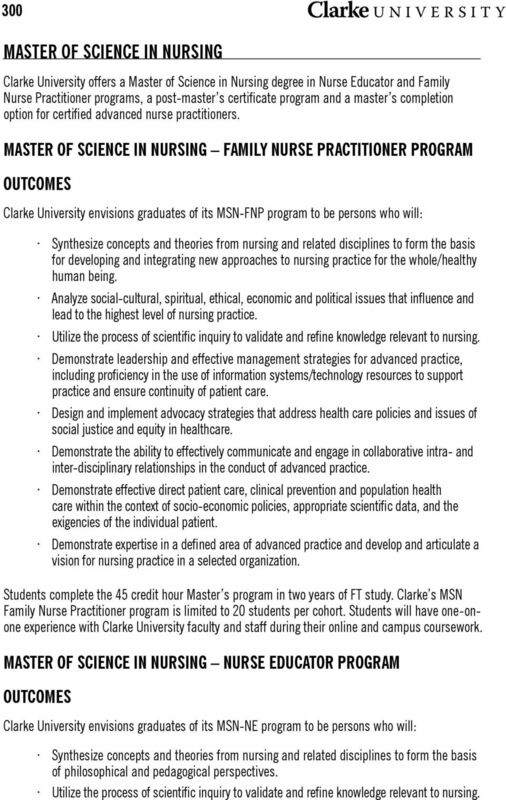 Clarke s MSN Family Nurse Practitioner program is limited to 20 students per cohort. Students will have one-onone experience with Clarke University faculty and staff during their online and campus coursework. 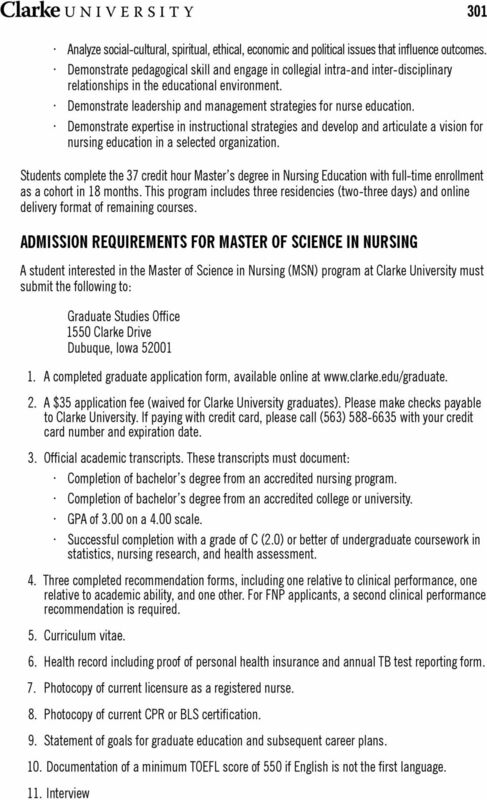 Master of Science in Nursing Nurse Educator Program Outcomes Clarke University envisions graduates of its MSN-NE program to be persons who will: Synthesize concepts and theories from nursing and related disciplines to form the basis of philosophical and pedagogical perspectives. Utilize the process of scientific inquiry to validate and refine knowledge relevant to nursing. 4 303 NURS 553 Primary Health Care Nursing of Families (6) NURS 602 Advanced Research (3) MSN Program Electives NURS 535 Professional Ethics (3) NURS 536 Curriculum Development in Nursing (3) NURS 542 Nursing Systems Administration (3) NURS 544 Informatics in Nursing (3) NURS 560 Bioethics (3) NURS 564 End of Life Care (3) NURS 566 Pediatric Palliative Care (3) NURS 569 Teaching in the Community (3) NURS 580 Special Topics (CV) NURS 587 Thesis (CV) NURS 590 Independent Study/Readings in Nursing (CV) Scholarly Project MSN students are required to complete a scholarly project and present it as part of their program requirements. 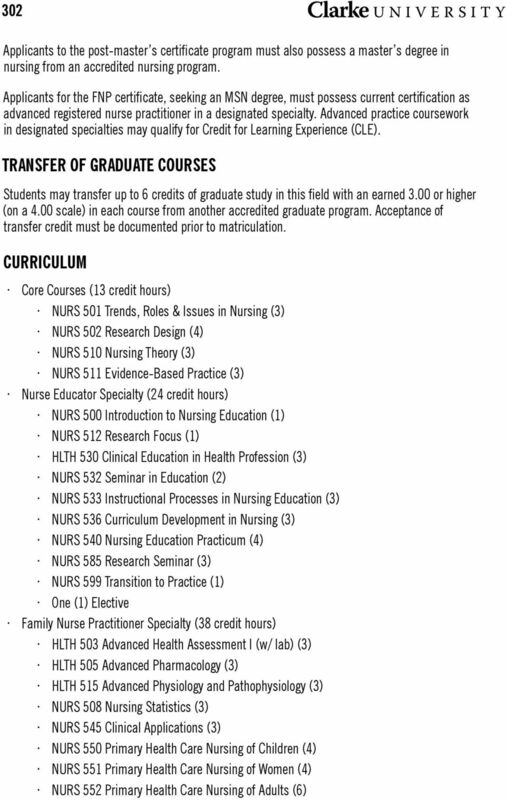 Students who do not complete the scholarly project during the last semester of coursework are required to enroll in NURS 587 Thesis for three credits each semester until the work has been satisfactorily completed. 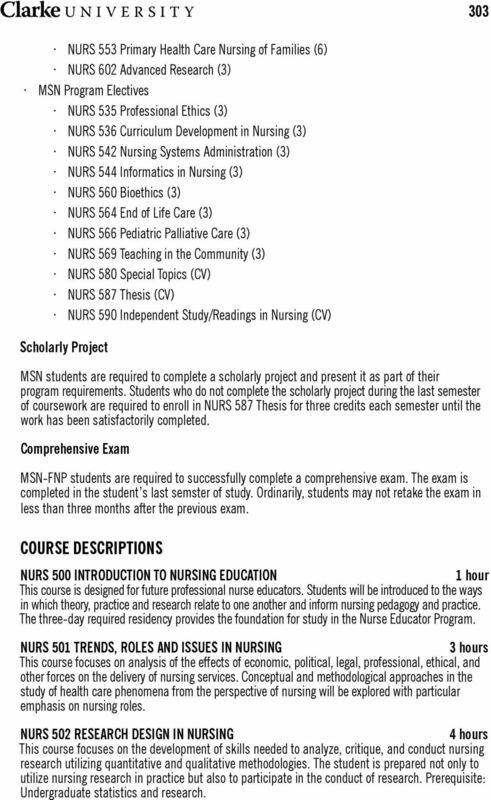 Comprehensive Exam MSN-FNP students are required to successfully complete a comprehensive exam. The exam is completed in the student s last semster of study. Ordinarily, students may not retake the exam in less than three months after the previous exam. 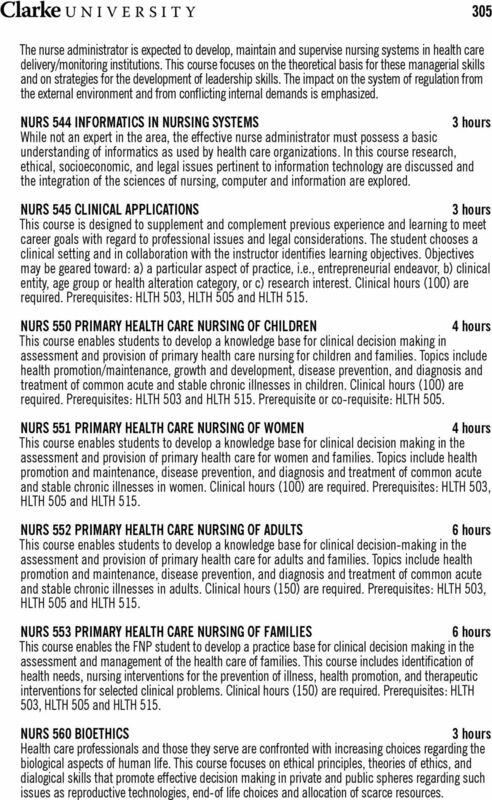 Course Descriptions NURS 500 INTRODUCTION TO NURSING EDUCATION 1 hour This course is designed for future professional nurse educators. Students will be introduced to the ways in which theory, practice and research relate to one another and inform nursing pedagogy and practice. 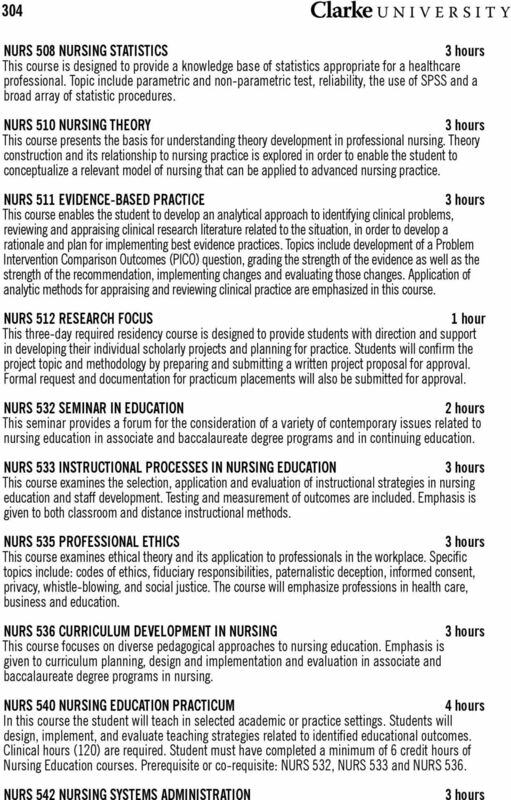 The three-day required residency provides the foundation for study in the Nurse Educator Program. NURS 501 TRENDS, ROLES AND ISSUES IN NURSING This course focuses on analysis of the effects of economic, political, legal, professional, ethical, and other forces on the delivery of nursing services. Conceptual and methodological approaches in the study of health care phenomena from the perspective of nursing will be explored with particular emphasis on nursing roles. 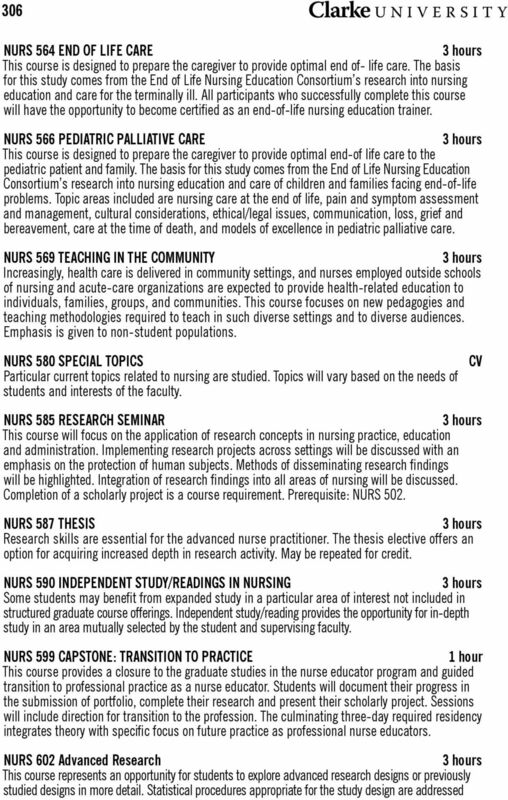 NURS 502 RESEARCH DESIGN IN NURSING 4 hours This course focuses on the development of skills needed to analyze, critique, and conduct nursing research utilizing quantitative and qualitative methodologies. The student is prepared not only to utilize nursing research in practice but also to participate in the conduct of research. Prerequisite: Undergraduate statistics and research. 6 The nurse administrator is expected to develop, maintain and supervise nursing systems in health care delivery/monitoring institutions. This course focuses on the theoretical basis for these managerial skills and on strategies for the development of leadership skills. The impact on the system of regulation from the external environment and from conflicting internal demands is emphasized. 305 NURS 544 INFORMATICS IN NURSING SYSTEMS While not an expert in the area, the effective nurse administrator must possess a basic understanding of informatics as used by health care organizations. In this course research, ethical, socioeconomic, and legal issues pertinent to information technology are discussed and the integration of the sciences of nursing, computer and information are explored. NURS 545 CLINICAL APPLICATIONS This course is designed to supplement and complement previous experience and learning to meet career goals with regard to professional issues and legal considerations. The student chooses a clinical setting and in collaboration with the instructor identifies learning objectives. Objectives may be geared toward: a) a particular aspect of practice, i.e., entrepreneurial endeavor, b) clinical entity, age group or health alteration category, or c) research interest. Clinical hours (100) are required. Prerequisites: HLTH 503, HLTH 505 and HLTH 515. NURS 550 PRIMARY HEALTH CARE NURSING OF CHILDREN 4 hours This course enables students to develop a knowledge base for clinical decision making in assessment and provision of primary health care nursing for children and families. Topics include health promotion/maintenance, growth and development, disease prevention, and diagnosis and treatment of common acute and stable chronic illnesses in children. Clinical hours (100) are required. Prerequisites: HLTH 503 and HLTH 515. Prerequisite or co-requisite: HLTH 505. NURS 551 PRIMARY HEALTH CARE NURSING OF WOMEN 4 hours This course enables students to develop a knowledge base for clinical decision making in the assessment and provision of primary health care for women and families. Topics include health promotion and maintenance, disease prevention, and diagnosis and treatment of common acute and stable chronic illnesses in women. Clinical hours (100) are required. Prerequisites: HLTH 503, HLTH 505 and HLTH 515. NURS 552 PRIMARY HEALTH CARE NURSING OF ADULTS 6 hours This course enables students to develop a knowledge base for clinical decision-making in the assessment and provision of primary health care for adults and families. Topics include health promotion and maintenance, disease prevention, and diagnosis and treatment of common acute and stable chronic illnesses in adults. Clinical hours (150) are required. Prerequisites: HLTH 503, HLTH 505 and HLTH 515. NURS 553 PRIMARY HEALTH CARE NURSING OF FAMILIES 6 hours This course enables the FNP student to develop a practice base for clinical decision making in the assessment and management of the health care of families. This course includes identification of health needs, nursing interventions for the prevention of illness, health promotion, and therapeutic interventions for selected clinical problems. Clinical hours (150) are required. Prerequisites: HLTH 503, HLTH 505 and HLTH 515. NURS 560 BIOETHICS Health care professionals and those they serve are confronted with increasing choices regarding the biological aspects of human life. This course focuses on ethical principles, theories of ethics, and dialogical skills that promote effective decision making in private and public spheres regarding such issues as reproductive technologies, end-of life choices and allocation of scarce resources. 8 including multiple regression, analysis of variance, multivariate techniques, nonparametric tests and factor analysis. Methodological designs examining measurement, measurement error and instrumentation related to developing, adapting, and selecting instruments will be explored. This course will include a brief orverview of quantitative, qualitative, and mixed methods designs. Prerequisite: NURS 508 Nursing Statistics 307 HLTH 503 ADVANCED HEALTH ASSESSMENT Assessing the health/illness status of clients as nurse practitioners requires synthesis and integration of knowledge from the natural and behavioral sciences, the humanities and nursing. This course focuses on comprehensive history taking and physical examination of the client, including developmental, psychosocial, cultural, occupational, and physical assessment. Laboratory experiences will focus on advanced diagnostic testing procedures and collection of history and physical data as well as the application of critical thinking and diagnostic reasoning in clinical decision making reflecting accurate differential diagnoses. Prerequisite: Admission to the nursing graduate program. 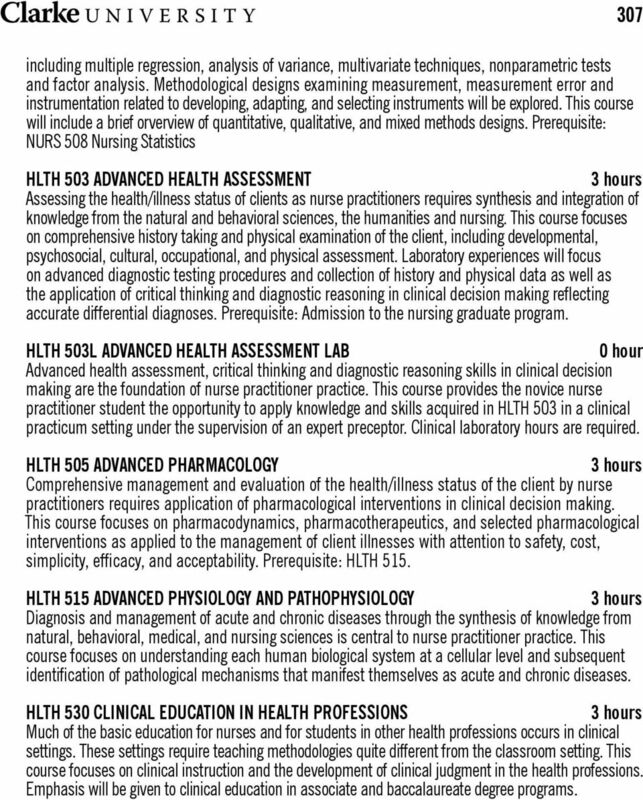 HLTH 503L ADVANCED HEALTH ASSESSMENT LAB 0 hour Advanced health assessment, critical thinking and diagnostic reasoning skills in clinical decision making are the foundation of nurse practitioner practice. This course provides the novice nurse practitioner student the opportunity to apply knowledge and skills acquired in HLTH 503 in a clinical practicum setting under the supervision of an expert preceptor. Clinical laboratory hours are required. HLTH 505 ADVANCED PHARMACOLOGY Comprehensive management and evaluation of the health/illness status of the client by nurse practitioners requires application of pharmacological interventions in clinical decision making. This course focuses on pharmacodynamics, pharmacotherapeutics, and selected pharmacological interventions as applied to the management of client illnesses with attention to safety, cost, simplicity, efficacy, and acceptability. Prerequisite: HLTH 515. HLTH 515 ADVANCED PHYSIOLOGY AND PATHOPHYSIOLOGY Diagnosis and management of acute and chronic diseases through the synthesis of knowledge from natural, behavioral, medical, and nursing sciences is central to nurse practitioner practice. This course focuses on understanding each human biological system at a cellular level and subsequent identification of pathological mechanisms that manifest themselves as acute and chronic diseases. HLTH 530 CLINICAL EDUCATION IN HEALTH PROFESSIONS Much of the basic education for nurses and for students in other health professions occurs in clinical settings. These settings require teaching methodologies quite different from the classroom setting. This course focuses on clinical instruction and the development of clinical judgment in the health professions. Emphasis will be given to clinical education in associate and baccalaureate degree programs.